I’m not sure how I lived before baby wipes. I would buy an occasional package to use as makeup remover cloths while doing a play, but since most of the work I do is TV — and wowwwww they sometimes give you these gloriously hot towels to remove makeup with — I never had wipes on hand. Then I had two babies and was suddenly buying them in bulk. Like, Costco bulk. Now, they’re stashed everywhere. In nearly every bag, in the cars, around the loft. We use them to wipe Arlo’s feet off after walking him in the not-so-clean streets of DTLA. I use them on small faces and hands, on my face and hands, on counters, on clothing, on the desk, on toys, on restaurant tables. They are wonderful and I love them. Costco, Boxed, Amazon…and when you stop having to use them to change diapers, a box like this will last a looooooooong time. A few months in after we adopted S, I realized that if you want skin products that are carefully and considerately made, buy baby. For all the hubbub about what you don’t want in moisturizers and cleansers and sunscreen, if you shop in the baby aisle, you’re likely to find many options that omit the yuck. And why shouldn’t you treat your skin like a baby’s? We’ve tried and use a number of different brands, but the one I like best is Aveeno Baby Continuous Protection Sensitive Skin. It’s mineral protection, which we now know is much better than chemical sunscreen. Read all about the differences here. It’s true that it takes more effort to apply, and on S’s skin it tends to leave a cast, but who cares?? I’d much rather take care of the kids’ skin. And I use it often now that I’m biking a lot. It isn’t too heavy or greasy, which other mineral sunscreens can be guilty of. I found this at Target, and the kids LOVE it. 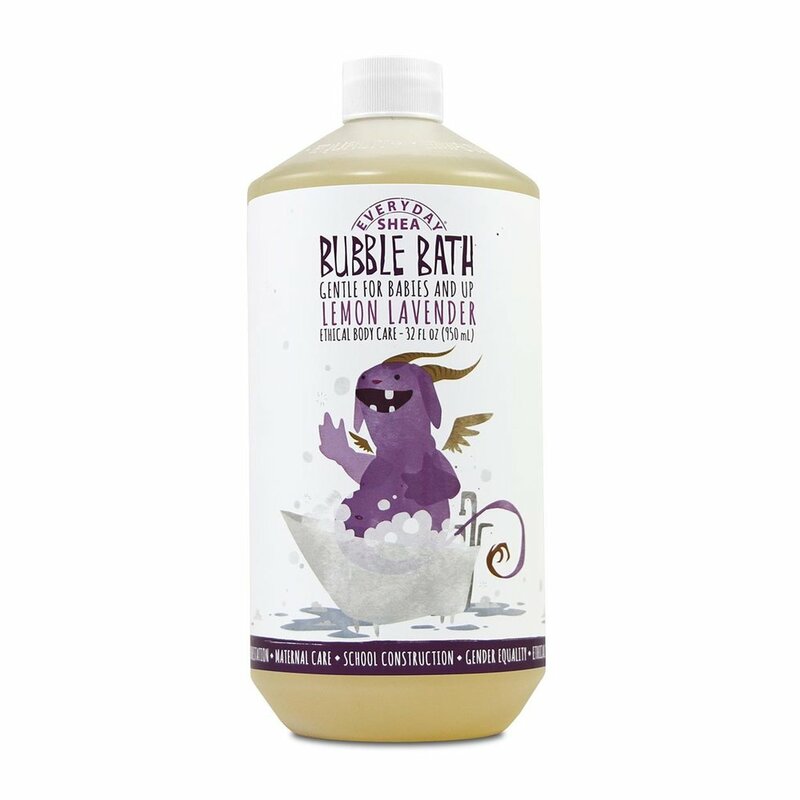 Its lavender lemon scent is light and lovely, the bubbles are bubbly, and I’m charmed by the fact that it’s made in my hometown, Olympia, Washington. Even better, Alaffia is a wonderful company driven by ethical trade and fair wages. They strive to empower mothers and families and funds from sales are directed to projects like Maternal Care, School Supplies, Eyeglasses and School Construction in Togo, West Africa. I’ve had my own bubble baths with Alaffia and I can tell you — they’re fantastic. Are there any baby products you swear by?